An Italian composer born in 1952 in La Plata (Argentina). After musical and scientific studies in Argentina, Daniel Teruggi entered the class for electroacoustic composition and music research at the Paris Conservatory (1977). In 1983 he joined Ina-GRM as head of pedagogy and musical production. He has been director of the group since 1997 and director of research and experimentation at Ina since 2001. He composes music for media support, for small ensembles and media support, as well as for instruments with real-time treatment. Acousmatic sound and space lie at the heart of his concerns. His works include the cycle Sphaera (1984-1989), Xatys (1988, first performed by Daniel Kientzy), Syrus (1992), The shining space (1999), Spaces of mind (2004), and the acousmatic drama Parole perdue (premiered in 2009 at the Festival of Radio France and Montpellier Languedoc-Roussillon). After music studies in composition and piano at the La Plata Conservatory in Argentina, and scientific studies in physics at the University, he followed a course in France, from 1977, in the class of electroacoustic composition and music research at the Paris Conservatory. 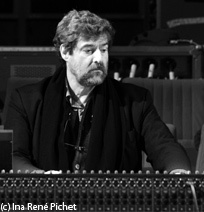 In 1981 he joined Ina-GRM (Groupe de Recherches Musicales of the Institut National de l'Audiovisuel) where he was at first assistant to composers such as Alain Bancquart, Carlos Roque Alsina, Iannis Xenakis. In 1983 he became a permanent member of the GRM as head of musical production and of development and the pedagogy of the system of transformation and real-time digital synthesis, Syter, developed at the GRM. He has been director of the group since 1997 and director of research and experimentation at Ina since 2001. He is also co-ordinator of the European project PrestoPRIME for the long-term preservation of digital collections and their integration into online digital libraries such as Europeana. He thus works actively for the preservation of audiovisual collections, works on media support and most especially electroacoustic music. From 1985 he specialised in the concert performance of works with the Syter system and the Acousmonium, a system of spatial projection. He has also undertaken research into the application of software developed on Syter on other computer systems. In recent years he has been most especially interested in the issue of composers’ creativity, their relationship with research and with the development of new tools that integrate their requirements and broaden the domain of concepts as applied to electroacoustic composition. He composes music for media support, for small ensembles and media support, as well as for instruments with real-time treatment. Acousmatic sound lies at the heart of his concerns. For Daniel Teruggi, the conditions of existence of acousmatic music are the following: being in a studio, working on media support, creating new sounds and then combining them. New sounds are obtained by deleting the referential character of captured sounds. This suppression of any kind of reference to the laws of mechanics operates either by cancelling these references, or by creating artificial movements that escape all logic. This referential annihilation is also to be found in his pieces for acoustic instruments treated in real time. For example in Xatys (for saxophones and Syter, 1988), the treatment breaks the mechanical logic of the sound of the saxophone. In Syrus (1992), a work for percussion and Syter, the sound, transformed according to the same principle, is confronted with the instrumentalist. By contrast in Wintrip, for bass clarinet, baritone saxophone, horn, tuba and DX7 (1988), the wind instruments undergo no treatment but are used in registers that enable harmonic and spectral fusion and the synthesiser, with complex sounds, plays a fusional role. Another example of the relationships that can be set up between fixed sounds and acoustic instruments: a reflective form oscillating between real/unreal as in Crystal mirages (1997) for piano and fixed sounds. Another fundamental thread running through the thought and and the music of Daniel Teruggi is the most particular attention paid to space. From his earliest works, he integrated it into his compositional research and style. The pieces in the cycle Sphaera (1984-1989), Eterea, Aquatica, Focolaria and Terra, each explore a different principle of using and combining the spatial possibilities of the four-track equipment, the Acousmonium and Syter (for control of the spatial projection); in this way are notably exploited various forms of sound trajectory, more or less complex, more or less rapid, various forms of localisation, superpositioning, etc. His spatial research was continued in, for example, The shining space (1999). For the composer the movement of sounds gives us the impression that an object has just passed by without us having had the time to perceive it, and it is therefore the sound imprint that we perceive; the very essence of acousmatics is indeed to listen to sounds of which the source is invisible. During the projection of these sounds, a spatial perception is produced thanks to our capacity for creating sound images by linking its spatio-temporal dimensions with our own perception. The composer thus defines four approaches to space: that of the sounds themselves, of the sounds in a work, the space within which the sounds evolve, and, finally, a space that calls upon our emotions, that of worlds constructed by our imagination. In his piece Spaces of mind (2004) he reconciles these worlds, presenting an experience of movement, of the plurality of sources, and offers play between discrete positions and complete immersion. Daniel Teruggi has composed many works, not only for the concert hall but also for the théâtre, the cinema and dance. His music has been recorded on various European and American labels; he is also the author of many articles, notably on acousmatic music, the projection of sound and the preservation of electroacoustic works. He has also developed an important teaching career. A Doctor in Art and Technology at the University of Paris VIII (1998), he teaches works on sound associated with the plastic arts at the University of Paris I Sorbonne. He directs a seminar on the new technologies and music at the University of Paris IV. He has been a guest teacher in Huddersfield, UK, and Berlin, and has given many lectures on electroacoustic music, the perception of music, audiovisual preservation and his own music. Les partitions de Daniel Teruggi sont inédites. Création : 20/07/2009 – Guillaume Depardieu (voix enregistrée), Emmanuelle Laborit (comédienne), Jean-Claude Fall (mise en scène). Montpellier, Théâtre des Treize Vents, Festival de Radio France et Montpellier Languedoc-Roussillon. DELALANDE François. Éléments d'analyse de la stratégie de composition. In : Actes du colloque : structures musicales et assistance informatique, 1-4 juin 1988, MIN, CNR, Marseille. [repris sous le titre Towards an analysis of compositional strategies, Circuit, 2007, vol. 17, n° 1, p. 11-26]. GARCIA Denise. « Concert multiphonie » : l’espace différencié. Ars sonora, mars 1998, n° 7, p. 99-120. PALMER John. Encounter with Daniel Teruggi and the GRM in Paris. 20th Century music, september 1998. TERUGGI Daniel. Quelles sont les conditions… Lien, 1991, n° spécial : Vous avez dit acousmatique ?, p. 19-20. TERUGGI Daniel. Un espace pour la réflexion Lien, 1991, n° spécial : L'espace du son 2, p. 85-86. TERUGGI Daniel. What about acousmatics ? Journal of Electroacoustic Music, 1993, vol. 7, p. 17-20. TERUGGI Daniel. Les développements de la recherche informatique au Groupe de recherches musicales de l'Institut national de l'audiovisuel (INA-GRM). In : Esthétique des arts médiatiques, tome 2, Sainte-Foy (Québec) : Presses de l'Université du Québec, p. 187-201. TERUGGI Daniel. L'interactivité dans les processus de création sonore et musicale. In : VINET Hugues, DELALANDE François (dir.). Interfaces homme-machine et création musicale, Paris : Hermès science publications, 1999, p. 185-193. TERUGGI Daniel. Le système Syter : son histoire, ses développements, sa production musicale, ses implications dans le langage électroacoustique d'aujourd'hui. Thèse de doctorat en Art et technologie. Paris : Université de Paris VIII, 1998. TERUGGI Daniel. Le son et sa représentation graphique, critères physiques et symboliques. In : Actes du colloque « Son et image : horizons interactifs », 19 janvier 1999, Monaco Centre des Congrès. TERUGGI Daniel. Preserving and Diffusing. Journal of new music research, 2001, vol. 30, n° 4, p. 403-405. TERUGGI Daniel. La musique électroacoustique en Italie. Avidi Lumi, 2001, n° 12, p. 120-123. TERUGGI Daniel. De phonogène en phonogène : cinquante années d'outils concrets. In : DALLET Sylvie, VEITL Anne (dir.). Du sonore au musical. Cinquante années de recherches concrètes (1948-1998). Paris ; Montréal (Québec) ; Budapest [etc.] : L'Harmattan, 2001, (Univers musical), p. 61-66. TERUGGI Daniel. Electroacoustic preservation projects : how to move forward. Organised sound, 2004, vol. 9, n° 1, p. 55-62. TERUGGI Daniel. Quel esprit pour demain ? In : TIFFON Vincent (dir.). La musique électroacoustique, un bilan : Actes du colloque des 2 et 3 mai 2000, Centre d'étude des arts contemporains. Villeneuve d'Ascq : Éd. du Conseil Scientifique de l'université Charles-de-Gaulle - Lille3, 2004, (UL3, Travaux et recherches), p. 79-82. TERUGGI Daniel. Technology and musique concrète: the technical developments of the Groupe de Recherches Musicales and their implication in musical composition. Organised sound, 2007, vol. 12, n° 3, p. 213-231.